If part one of making things with meaning is to learn more about yourself then part two has to be all about leaning in and connecting with the world. For me a deeper understanding of what resonates with me helps me get myself into situations that I more likely connect with. Even then I feel that the camera can be a barrier which makes me more an observer, rather than a participant in the world. The answer to the question of ‘how to break down that barrier’ is seemingly obvious. Take time to experience the place and people that you’re going to photograph and build a relationship before rushing to grab a few shots. Michael Kenna says that he takes time to talk to the land before he photographs, I suspect that this is his way of ensuring that barrier is broken down. It’s a good practice to take time to wander around with out the camera and see what’s grabbing your attention before racing in to photograph. Not advice I always follow myself and I can tell when I do and when I don’t. The same goes for people too. I can’t imagine why you would want to photograph people, to make their portraits, if you’re not genuinely interested in who they are and what’s their story. Again, I think that you can tell when you look at the work from people who ‘stole’ the portraits and those who really took the time to engage. Make photographs about things you care about and make me care too. 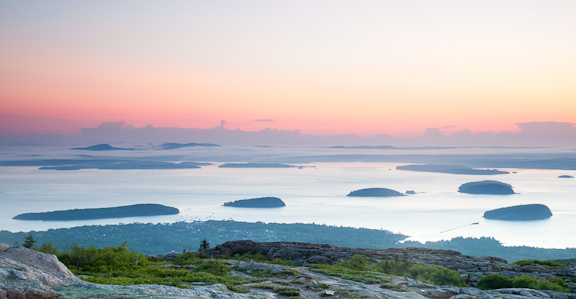 Cadillac Mountain is the highest point on the eastern seaboard and as such is one of the first places to view sunrise. This means an earlier start to the day than usual, even earlier in the middle of the summer. The image above was made last weekend on my third visit to Cadillac mountain. The first time I barely knew how to turn my camera on. By my second visit I knew how to turn the camera on but didn’t know where to point it – I was however in great company. The intro to this Joe McNally video was shot at the Moose Peterson DLWS workshop I attended on the day we visited Cadillac Mountain. On my third visit to Cadillac Mountain I had learned more or less where to point the camera and I was again in great company. This time with John Paul Caponigro‘s Maine Islands workshop, a challenging but fun few days. More about that soon. I was lucky enough to attend the flashbus boston stop recently. An amazing flash extravaganza, starting slowly with David ‘The Strobist’ Hobby and building to a crescendo with a live demo in the afternoon from the Dean of Flash Joe McNally. I wasn’t quite sure what to expect or for that matter why I was even going – I rarely take photos of ‘people’ and when I do I’m not fluent enough with flashes to incorporate them into the mix. I’ve actually given presentations in the Long Wharf Marriott conference rooms but to a crowd smaller than the 250+ that were there to see Hobby and McNally perform. It was fun to have an opportunity to interact with Hobby before the event began – he worked the line of photographers laden down with all the gear they own as they waited to get the Adorama event band and associated goodie bag. Hobby’s presentation was a walk through of a series of images to show how he builds ‘Layers of Light’ to get the look that he wants for a particular photo. I must admit that it actually made sense and seemed quite a logical approach to getting the photo. I’d seen McNally up close a while ago now at the Acadia DLWS in 2007 that was just before the moment it clicks came out and his star as an educator began to rise. Then he did a couple of on location small flash lighting demos that were quite impressive. In the Marriott ballroom he started quite simply with one light building to a finale photographing Bruce (an audience member) with 4 lights including a gridded snoot for Bruce’s impressive beard. The day really was a firehose of information and someone more practical than I would probably be able to put it to good use. I feel like I need some further study. Fortunately both Hobby and McNally have supporting DVDs. I have McNally’s and certainly recommend it (check out a clip here) and I suspect that Hobby’s 7 disc set would be well worth the money. I think Zack Arias‘s one lighting workshops are also worth checking out. There are a couple of places to get these – the live workshop, the One Light DVD, and the CreativeLive workshop. Zack starts more basic than Hobby and his teaching style resonates with me more than Hobby and McNally. For me the progression should be Arias, Hobby, McNally although they all have something to offer for everyone.